Hot stuff. 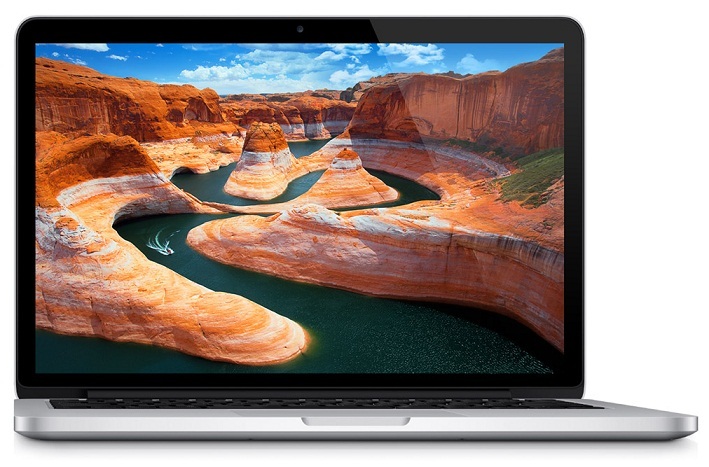 The Apple MacBook Pro 13 is now available with a high-resolution IPS display, a slimmer chassis, and new ports. The newcomer demands a price premium of 500 Euros (~$650) above the cost of the time-tested standard model. Do the changes really warrant the lofty starting price of 1750 Euros (~$2275)? Dopo l’originale MacBook Pro classe Retina da 15 pollici, l’arrivo di un 13 pollici appare quasi scontato. Nel nuovo modello, il display Retina conta il doppio dei pixel, da 1.280×800 a 2.560×1.600, con tanto di modalità HiDPI, che rende più definita l’interfaccia di dimensioni e proporzioni simili alla precedente. This isn’t a MacBook for the average consumer – the Retina display is overkill for most people, and the price premium is substantial. If, however, you’re a creative professional who is constantly on the move, then the appeal is obvious. With a glorious high-DPI display crammed into a 1.63kg chassis, Apple’s new MacBook Pro is one of a kind. A small laptop with a very big screen. The 13in Macbook Pro Retina is a very desirable lightweight laptop, but it is expensive with the even the cheapest 128GB SSD model costing a high £1,449. The expense can't be justified for most people, but if you have the cash then it's definitely worth considering over other lightweight laptops. Apple’s MacBook Pro 13-inch with Retina Display is a worthy smaller sibling to the earlier 15-inch version, bringing the MacBook Pro and Air lines closer together than ever with its gorgeous, sleek chassis. It’s beautifully crafted, offers great ergonomics, and its ‘Retina’ screen is simply superb. Even connectivity is superior to that offered by most ultraportable laptops. However, its battery life is merely on the good side of average; it doesn’t match the power of its other components and that beautiful screen with a decent graphics solution; and its high price means there are plenty of rivals which offer more features – sometimes even for less money. In other words, you probably won’t regret buying it, but make sure an alternative doesn’t suit your needs better. The essential specifications of the 13in Apple MacBook Pro with Retina display closely follow the groundbreaking original 15in version. Reduced size here necessitates integrated-only graphics, as well as a more efficient dual-core rather than quad-core processor. But this choice of components really delivers, and crucially in a state-of-the-art 13in notebook that takes the second-finest laptop display money can buy – beaten only by the 15in Retina model of the Apple MacBook Pro. With its sturdy unibody design and high performance, Apple's MacBook Pro quickly became the must-have laptop for on-the-go media professionals. The 13-inch MacBook Pro boasts a superb high-resolution display and a slimmer, lighter physical design than its predecessor. Sadly, its average performance doesn't justify the astonishingly high price. Speaking of software, Mac OS X Mountain Lion is a model of how to introduce new features without sending users over a speed bump as Windows 8 does. Welcome additions in Apple's latest operating system range from Power Nap, which (like Intel's Smart Connect) updates e-mail and social-network data while the computer sleeps, to iOS-style notes, reminders, and pop-up notifications. The standard MacBook Pro design hasn't changed. After the stellar 15" version, this year's 13" MacBook Pro with Retina Display won us over with its impeccable finishing, quality screen, silent fan, battery life and processing power. All Apple has to do to reach perfection is add Ethernet and lower the price... Hey, you can always dream, right? This isn’t the right MacBook for the average consumer – we struggle to see the benefit of a Retina display outside professional use, and the premium is substantial. If, however, you’re a creative professional who’s constantly on the move, or just obscenely well-off, then this pint-sized MacBook Pro is uniquely attractive. With a colour accurate high-DPI display, great battery life and nippy application performance crammed into a 1.63kg chassis, Apple’s updated MacBook Pro is one of a kind. As a MacBook Pro we worry that this won't be powerful enough for you; as a MacBook Air it's a lot fatter and heavier for a device that doesn't give you much above and beyond what the Air delivers. That leaves us wanting more from the MacBook Pro 13-inch, and suggests that if you want real power you'll have to go for the much larger 15-inch model. 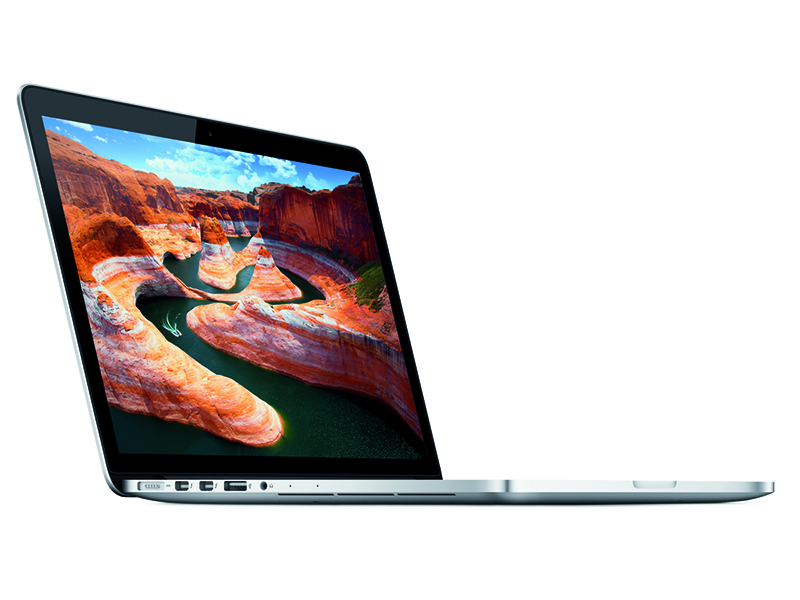 Apple's late 2012 13-inch MacBook Pro with Retina display isn't for everyone. Many will baulk at the price, and even those who are willing to pay it should ask themselves whether the small saving and slightly smaller size is enough to recommend the 13-inch Retina notebook over its 15-inch counterpart. In all fairness, the 13in MacBook Pro with Retina Display is undoubtedly a terrific laptop. It provides good performance and battery life, lightweight design, and a screen that none of its PC rivals can even come close to matching. But at almost £1500 it’s very expensive indeed, and I’d have thought that the professional users who can afford that price would be more likely to opt for the 15in model anyway. It’d be a tempting upgrade at around £1300, but at this price I reckon Apple is pushing its luck. When I reviewed it, I really liked the 15-inch Retina MacBook Pro. It's very fast, amazingly portable given its size and has a wonderful display. Its 13-inch counterpart, takes the portability to a completely different level. While I loved toting the 15 around (especially compared to its 2011 predecessor), it'd still feel like a burden after a long day of meetings. Using it in coach on most airlines was also problematic at times. The new MacBook Pro is the best MacBook yet but it can’t offer the value of the 2011 version. You’re paying almost 50 percent more for the best laptop screen around and faster flash memory. That saving could get you a new iPad with a Retina display, iPad Mini or an iPhone 5. It’s hard not to admire the sheer quality of the MacBook Pro’s design. However, Apple’s pricing makes it difficult to see exactly whom this model is aimed at. Home and business users on a budget will prefer the standard £999 model, while high-end users who might be prepared to pay for the Retina display seem more likely to opt for the larger 15-inch model. The Apple MacBook Pro 13 with Retina is everything that many people hoped would have been announced back in the summer with the 15-inch version. It features the highest resolution display in this class with outstanding color and solid performance to back it. It is as small as many of the latest ultrabooks as well but with higher performance and just as long of running times. Until the next crop of Ultrabooks (or Chromebooks?) turn up with better-than-Retina displays, it’s safe to say this is the laptop we’d choose if money were no object. The 15in Retina Display MacBook Pro does offer more processing power, but the 13in size and relatively light weight mean you can take this eye-popping laptop anywhere without thinking about it. Undeniably, the 13" MacBook Pro with Retina display is a show-stopper when it comes to display quality, materials, design and fit and finish. The question is, in a worldwide depression, are these enough to sell a laptop that starts at $1,700? I have a feeling that Apple doesn't expect this notebook to be a huge volume product like their bestselling standard 13" MacBook Pro that happens to also be their most affordable notebook. The 13-inch MacBook Pro with Retina display, the one we really wanted to see earlier this year when the 15-incher was unveiled, is finally here. But, it isn't quite the perfect blend of Pro performance and Air panache we'd hoped for. That it's actually thicker than its big brother, the 15-incher, is a bit of a bummer but, with its weight falling closer to Air territory than the Pro, the decision between the two models will be a tough one for frequent travelers who need a little more oomph. The Apple MacBook Pro 13-inch (Retina Display) is the best way to carry the pixels of a large-screen monitor with you on the road. It's ideal for people who make their living with visuals. The 13-inch MacBook Pro with Retina Display is a lot like the iPhone 5. Apple took a winning formula and perfected it by making it thinner, lighter and faster. But in this case the display isn't bigger. It's a quantum leap better than the regular MacBook Pro and other ultaportable notebooks. Are all of these improvements worth $500 more? By adding a high-res Retina Display to a new 13-inch MacBook Pro, Apple has taken the odd man out of its MacBook line. While the Retina MacBook Pro is easily the most desirable 13-inch Mac laptop to date, the high price and lack of discrete graphics make it a tough call versus either the more powerful 15-inch Retina Pro or the more affordable 13-inch Air. 95% Lang erwartet, endlich da! Postive: Compact size; screeen resolution (2560x1600); connectivity; battery life. Positive: One of the best displays with high resolution; compact design; silent cooling system. 84.69%: This rating should be considered to be average. This is because the proportion of notebooks which have a higher rating is approximately equal to the proportion which have a lower rating.